Coal is a sedimentary rock that is formed in bogs and swamps when plants don't fully decay (rot away) after they have died. Peat is the first stage of coal formation. It is found on the surface of boggy and swampy conditions. It can be dried out and used as fuel, but gives off less heat than coal. Lignite is formed from peat which has been buried to a depth of less than 2km. It is brown and crumbly. It does not produce as much heat as black (bituminous) coal. Bituminous coal is the most common type of coal and often has bands where layers of plant materials have been squeezed together. It may be bright and shiny or dull and sooty. It is formed from beat buried to depths of 2-5km. In Britain, most coal was formed about 300 million years ago in the Carboniferous period. 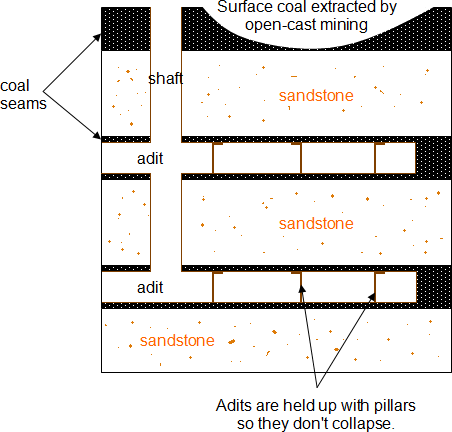 Coal is extracted (taken out) out of the ground by mining it.